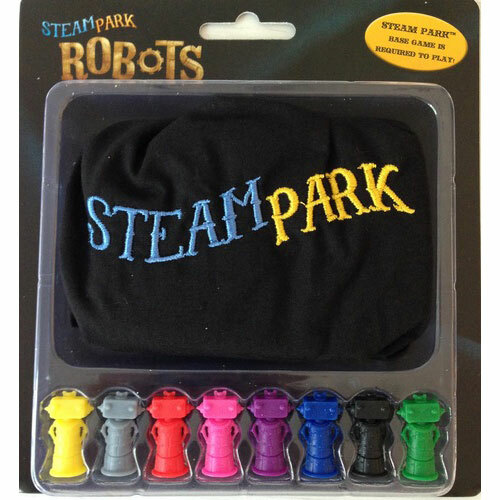 Steam Park: Robots is an expansion for Steam Park by Lorenzo Silva, published by IELLO. It is for 2-5 players. This expansion allows players to replace the wooden meeples in the base game and the Play Dirty expansion with molded plastic robots. It also introduces a new type of robot, the V.I.R. For more information on the base game, please check out the link below. You can also see more on how to play the game by checking out my review of the Play Dirty expansion by following this link. Aside from the new replacement robot visitors, this expansion adds yet another new type of visitor, the V.I.R. These visitors are placed in the visitor pool but are not added to the bag during setup. These visitors are considered wild visitors and may be placed on any ride regardless of it’s color. To be able to attract a V.I.R. and place them in the bag, requires the player to spend only 1 attract visitor action die. This allows them to place a regular visitor and a V.I.R. into the bag. The player then draws 2 visitors from the bag instead of the normal 1. Other than that, they pretty much act just like normal visitor. However, during the Income phase, the player gains 3 denari for each V.I.R. in their park, as well as 1 dirt. As I mentioned above, this expansion adds new custom molded plastic robots to use as the many different types of visitors, including the Stingy Visitors seen in the Play Dirty expansion as well as the new V.I.R. visitors. The plastic visitors are really cute and are brightly colored. The expansion also adds a new custom bag to hold them all in. The bag has a really nice looking embroidered logo on it. Thematically the robots look great inside each player’s park. I love how nice they fit in with the overall look and design of the game. These are a really great component upgrade. I really like them. The rulebook for this expansion is quite small. There are rules in 8 different languages. Each one consists of only a single page, front and back for each one. There are no pictures in the rules, but they aren’t really needed either. The rules explain the new V.I.R. visitors as well as covering the Stingy visitors from the Play Dirty expansion which also have been upgraded in this expansion. The rules are easy to read and It only takes a minute or two to read over everything. Just like previous rulebooks, that quirky sense of humor is still present. Overall, I’m good with the rulebook and I think it covers everything quite well. One thing I’ve really found enjoying is to upgrade and bling out my favorite games. This expansion does that in a great way. Not only do you get little plastic robit miniatures, but also a sweet looking bag to hold them all in as well. I like that even though the designer didn’t have to, he covered the rules for the Stingy visitors in the rulebook. I’m thrilled with the overall look of the robots. They really give that wow factor to the game. As for the actual new gameplay of the V.I.R.s, I like having yet another new type of wild visitor to add to the game. They add yet another dimension to the game to help you make a little more money with. I enjoy the expansion and feel like it’s a must have expansion. Fans of the original game and the Play Dirty expansion will most definitely want to add this to their game. I highly recommend it. Steam Park: Robots is an expansion for Steam Park that upgrades the visitor meeples included in both the base game and Play Dirty expansion. This expansion does not add any additional play time to the base game. The plastic robots and embroidered bag look amazing. They really add a more thematic look to the game. The quirky humor is still there in the rulebook, even though it’s quite small. The expansions adds another modular style of play with the V.I.R. visitors that’s a lot of fun. Fans of the base game and expansion, will most definitely want to add this to their game. It’s a great component upgrade and one that I feel is a must have. I love the overall look and design. I highly recommend it. It’s bling-tastic! This entry was posted in Reviews and tagged board, board games, card, card games, games, iello, lorenzo, lorenzo silva, park, robots, silva, steam, steam park. Bookmark the permalink.